Knight of Wands Tarot Card Meaning - All Explained HERE! 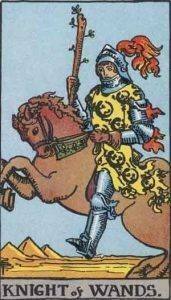 The Knight of Wands is the eleventh card in the suit of Wands. The Knight of Wands, much like the Page of Wands, exists in a barren desert. He even dresses similarly, with a salamander motif, though unlike the Page, he is moving at speed. The Knight has decided his goal and is on his way. The Knight of Wands represents travel, leadership, and determination with a goal in mind. Past – The Knight of Wands in the Past position can represent a past time where you were spontaneous and acted quickly, although not without forethought; you were aware of the potential outcomes. You may have been extremely mature for your age as a child, or during school and you probably held more responsibility than average. Looking to the past might be a good thing to do for you now, especially if you had a different personality when you were younger than now. Present – The Knight of Wands in the present position can signify upcoming challenges; possibly one great challenge. You may be searching for meaning and may be longing for a journey. If you’re planning to get away, then just do it, especially if you’re feeling at a loose end; a short trip soon could change your worldview for the better. If you haven’t got any plans, try to experience something completely new, such as an foreign country you’ve never been to. It’s likely you’ll hear good news soon, especially related to work or your career. Future – The Knight of Wands in the future position can suggest a life you are happy with if you’re willing to work for it. It isn’t about earning money, it’s about reaching your potential. You have to give it your all, through a mixture of passion, applied talent and effort. If you have a goal in mind, you must start today. You need to start taking more chances, start saying ‘Yes’ to things which are offered. If you’re not a people person, you’re really going to have to come out of your shell in order to succeed. Don’t rush this, it should come naturally as long as you try a little. Work / Education – The Knight of Wands in regards to work or education is a good sign. If you’re waiting for a message, be it a university or school acceptance letter or a job offering, then you’re in luck, even more so if where you’ll be going is a long distance away. General work issues may start to bother you less as you get into the swing of things. Generally speaking the Knight of Wands is a positive sign to see when relating to your career; you should soon feel like you are in control of this aspect of your life. If you’re starting a new project, then you’ll likely get more and more passionate with it as you go on, even if you aren’t that invested right now. Romance – The Knight of Wands in romance is a very good sign. Expect a new level of deep connection in any existing relationships, but also the introduction of a new, adventurous side of your partner. The Knight of Wands is an especially good sign when it comes to finding love if you’re currently single. If you’re available and looking, expect to find somebody in your workplace, or a workplace that is related to yours. You don’t have to look far sometimes, and this person will accompany you to the ends of the Earth. Friends – The Knight of Cups in regards to friendship can signify an upcoming trip you’re all going to take, or a joint venture that would be too good to miss out on. If you weigh it up and the gains outweigh the risks, just go for it. You only live once! It’s likely to be sprung on you when you don’t expect it, but if the offer is there, you could do worse than to take it. Take action if things are getting stagnant in your friendship circle; go out of your way to bring everybody together. Money – The Knight of Cups in regards to finances is another good sign. It might seem like money is coming thick and fast, but remember to save a sensible amount, even if things feel secure. You might feel tempted to spend a large part of your savings on a new experience, a holiday for example. This may actually be a good idea, especially if you’ve been feeling stagnant for a while now. It’s time to take action, so go out there and enjoy life. Health – The Knight of Cups generally has a ‘Yes’ vibe to it when you ask a question. If you’re nervous about your current physical state of being, expect an improvement. Mentally, try to constrain your thoughts and don’t let them go wandering too far. If you’re currently ill, just remember to take baby steps. Don’t overdo it. One step at a time. Spirituality and Mentality – The Knight of Cups in spirituality signals further growth, if you open yourself up to all possibilities. There are so many doors open and shut every hour of every day. Look for ways that life is telling you to move in a certain direction, and follow it. This can specifically signal physically moving somewhere for a new perspective. Even the more stoic ones among us will sometimes feel the fire of anger burning up within when life demands it. Don’t be angry at yourself if you haven’t achieved something yet. It’s normal to be annoyed if you didn’t make the cut but sometimes it happens. Accept it, grow, and defeat it next time. Be sure that what you’re attempting isn’t too big a feat. You might not have any control over what is happening but you’re deciding to fight it anyway. We’ve selected live tarot readers to give you a FREE 3 Minute interpretation of The Knight of Wands! Scroll through them below and pick your favorite one.